As the following Saudi Aramco chart shows, the company wasn't always the most dominant force in the global energy market. Founded in 1933, Saudi Aramco – officially known as the Saudi Arabian Oil Co. – is Saudi Arabia's state-owned energy firm. It's considered the biggest company in the world in terms of valuation, which is estimated around $3 trillion. That sky-high valuation will make the Saudi Aramco IPO the biggest stock offering in history when it debuts in 2017. 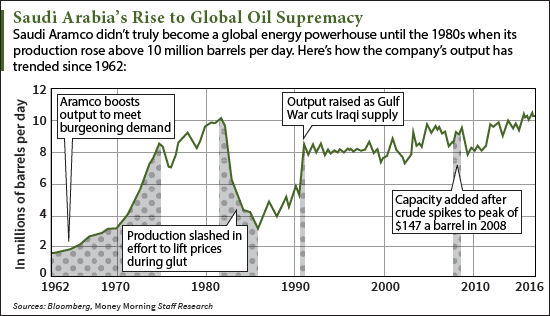 The company's rise to dominance in recent decades is mostly attributed to its giant oil output. As you can see, Saudi Arabia oil production began accelerating after OPEC formed in 1960. Saudi Aramco boosted output to meet rising oil consumption around the world. According to the OPEC website, average world oil demand jumped 43% from 62.9 million barrels a day in 1960 to 89.9 million in 1980. By the early 1980s, Saudi Aramco production hit a peak above 10 million barrels a day. But the Saudi Aramco chart shows the firm cut production in the mid-1980s as oil prices plunged due to a global supply glut. During the decade, crude oil prices dropped from roughly $35 a barrel to $10. That urged Saudi Aramco to lower its daily output by nearly 75% to about 3 million barrels. Over the next 30 years, Aramco oil production surged back toward 10 million barrels a day. The rise in output was spurred by the Gulf War and rising oil prices, which reached $147 before the 2008 financial crisis. As of July 2016, Saudi Arabia oil production is at an all-time high of 10.7 million barrels a day. Aramco's production and reserves are two of the few details the country discloses. 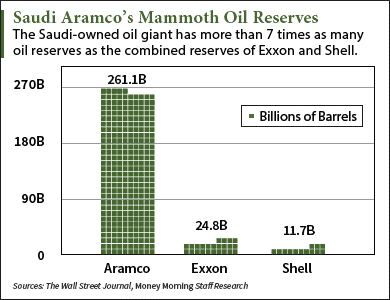 As this Saudi Aramco chart shows, the company sits on about 261.1 billion barrels of oil. That's more than 10 times the reserves of Exxon Mobil Corp. (NYSE: XOM), which is the world's largest independent energy firm. Since the 1970s, Saudi Aramco's oil supply has made up 80% of the country's revenue. But Deputy Crown Prince Mohammad bin Salman – the son of Saudi King Salman – has a long-term plan to shift his country's dependence away from oil. 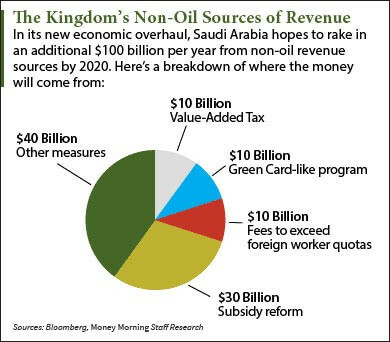 Prince Salman's economic reform focuses on generating revenue from non-oil sources. 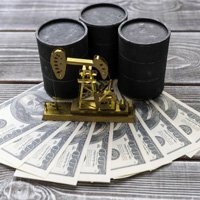 In an interview with Bloomberg, the prince said Saudi Arabia wants to raise $100 billion a year from non-oil sources of revenue in the next four years. That's three times the size of the kingdom's non-oil revenue right now. One of the plan's biggest targets is the reform of energy subsidy programs. These are payments distributed by the government to make up for the economic effects of low oil prices. For example, a subsidy paid to an oil worker might be a bonus to his or her annual salary. Since low crude oil prices affect a firm's profitability, that subsidy would ease the effects of low prices on that worker. But the crude oil price collapse has forced the Saudis to save money wherever possible. That's why the new economic model will save at least $30 billion in revenue by reducing subsidies through 2020. The kingdom's new model – along with the Saudi Aramco IPO set for next year – mark big changes for the country. Saudi Arabia's public sale of Aramco will be unlike anything the world has ever seen. "Using its vast oil wealth, Saudi Arabia will create the single largest publicly traded stock in the world," Moors said in April. "Make no mistake. This new strategy will impact every single investor on the planet." Stay tuned to Money Morning for more Saudi Aramco charts, updates, and information. Alex McGuire covers the global energy market for Money Morning. Follow him on Twitter for the biggest updates on Saudi Arabia.